Why Should Your New Heater Be Professionally Installed? 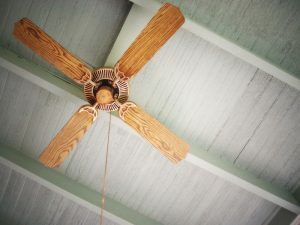 Can a Ceiling Fan Make Your Heater More Efficient? When it comes to Waterloo, IA heating, we understand you want a system that is cost-effective and powerful. This means finding the most efficient heating system on the market that’s within your budget and is perfectly matched to your home, and having that system professionally installed. Installation is literally just the beginning, though. There are a number of steps you can take that cost you little to nothing that will boost the efficiency of your heater even more—installing weatherstripping on drafty windows and doors, closing your curtains to provide extra insulation to keep the heat in, and, that’s right, using your ceiling fan. Read on! Refrigerant, which transfers hear from the inside air and expels it outdoors. An indoor coil, to help absorb heat and cool down the air coming in. A compressor, which adds pressure to the refrigerant so it can do its job. Without these components and more, all any fan can really do is recycle stale air already present in the home. So as we said, a fan moves air… and that’s all it needs to do! Yes, we are going to get to your heater and its efficiency, but first we want to finish explaining a fan’s purpose. The fan in your air conditioner evenly distributes the air produced from it, and that is what a ceiling fan does, too. The ceiling fan takes the air that’s coming from your stagnant vents and circulates it throughout your home so you feel cooler, and therefore are able to turn up the thermostat a bit, thus saving money. Now that you understand the process, we can tell you what this has to do with your heating efficiency. Your ceiling fan actually has a switch on it. This switch is most often found near the center of the fan where the light fixture mounts, and it changes the direction of your fan blades from counter-clockwise to clockwise. When you run your ceiling fan clockwise while also using your forced-air heater, it helps move that heat more evenly throughout your living space. Some advanced ceiling fans might even have an additional wall switch, or a remote control, that you can use to reverse the direction of the fan blades. Just like with your cooling system, when you use your ceiling fan as a supplement, your heater doesn’t have to work as hard. This efficient operation saves you money in the long run. At Dalton Plumbing, Heating, Cooling, Electric and Fireplaces, Inc., your comfort is our promise! To set up an appointment, give us a call at the number above, email customerservice@daltonphc.com or schedule an appointment online.